Our free one-to-one virtual mentorship boot camp will teach you everything from value pricing to social media, helping you transition to the cloud. Learn from our top ProAdvisors on how they have successfully scaled their business to the cloud. Find new & improved workflows that can take your business to the next level. Get exclusive virtual training on QuickBooks Online third-party apps. For more information about the English and French Intuit Mentorship Programs, contact your Intuit account manager. Our one-to-one virtual mentoring boot camp will help you successfully transition to QuickBooks Online and make your business run more efficiently. 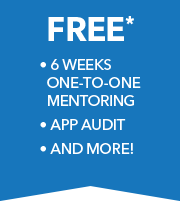 Up to 6 weeks of one-to-one virtual mentoring with a seasoned bookkeeping mentor. Audit and recommendations on top apps to solve your biggest pain points. Best practices and tips and tricks on data migrations to QuickBooks Online. How to prospect new clients successfully through social media. How to transition to value pricing. "The QuickBooks Online mentorship was exactly what I needed to bridge the gap between knowing I needed to get on board with the “new” way, and actually putting the steps in place. I love finding newer, better ways of doing things. Not only do our own businesses benefit, but our clients do as well! This would not have been possible without my mentor." The Company agrees to purchase and pay 10 QuickBooks Online Essentials and/or Plus subscriptions for its clients on a monthly basis, for a minimum of 12 months from Purchase Date. The mentorship service will be fulfilled after The Company has purchased 10 QuickBooks Online Essentials and/or Plus subscriptions. Purchase of all 10 QuickBooks Online subscriptions must be purchased at the same time. Previous paid QuickBooks Online subscriptions cannot be applied to the 10 subscriptions required for this offer. Firm has 90 days from their purchase date to redeem their offer incentive. Intuit shall provide Company with 1:1 mentorship for a maximum of 6 hours (1 hour per week) for six weeks on a date agreed by both the mentor and mentee. Only 1 person from the firm will be mentored and it must be the same person. Mentorship program will not go over 6 sessions, however, if agreed by both parties (mentor & mentee) the program can be covered in less than 6 sessions. Intuit shall use its best efforts to start the mentorship within 45 business days after the Purchase Date. This offer cannot be combined with other offers. 5 business days’ notice is required to reschedule a session. If you request a change in your scheduled mentor session without the minimum notice or miss your mentor session, you will forgo that session and there will be no rescheduling. The Company is responsible for ensuring they are equipped with sufficient Internet bandwidth to facilitate the live webinar. Potential topics may include but are not limited to: QBO tips and tricks, workflows, finding the ideal client for QBO, identifying 3rd party apps to help you work more efficiently, transitioning to value pricing, how to prospect new clients through social media.